I’ve got a piece in today’s Hampshire Gazette! But you might have to log in to read it. I’ll post it here in a few weeks, it’s about Little League and all the agony I endure watching it. Here’s a piece I wrote for them a while back. It’s a little light reading about spring break at Gettysburg. I am walking across a battlefield of the Civil War. I’m carrying six-year-old Younger on my back, because he is very tired from a long day of sight-seeing. This field was one of the bloodiest spots in the war, and we’ve come to reflect and watch the sunset. As I watch my husband and older son walk along the ridge, it finally all becomes too much for me. I kneel down in the grass, hug Younger, and cry. 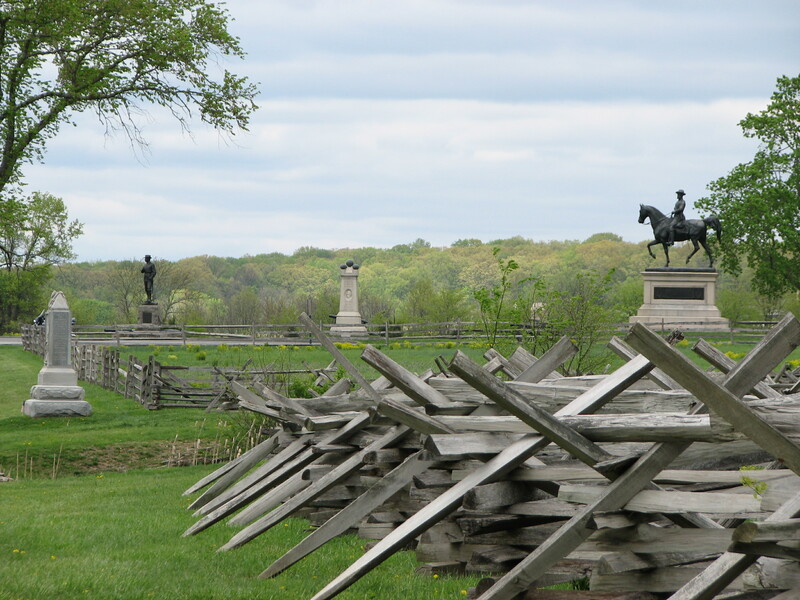 A lot of people thought it was strange that we would pick Gettysburg as our spring break destination. Maybe it shows a certain level of nerdiness that we thought it was perfect. I wasn’t sure what I was expecting to teach my sons by going there. For him, it was a simple fact of life that he’d already wrapped his head around. For me, it has always been devastating. I think of a soldier’s parents, siblings, children, spouses. I think of their personal stories and the future that, whether or not they come home “safe,” is irrevocably, tragically altered. As we talked about the reasons for the Civil War and why the people were fighting, I tried to express these ideas to my sons. People aren’t always fighting for the cause they believe in. Sometimes they fight because they have to, they have no choice. And whether or not the Confederate soldiers really believed in slavery and freedom from Northern oppression, nobody on those fields really wanted to die for the cause. Everyone was terrified. So what did I want him to understand? That a statue of a general is more than bronze? It became so clear while we stood on the battlefield realizing what happened right under our feet. As we learned the stories of the men it was easier to understand that the person in the statue had a life and a family. Houses and barns from that battle are still standing, and one had a cannon hole blasted through the wall. I kept asking my husband, where did they go? Did they hide? What did they do when the battle was literally on their front doorstep? I want my kids to know that America didn’t get where it is today without battles on many levels. No one is ever one hundred percent right, but working cooperatively for something better is the only way to make it work. Someone who throws a tea party in the name of patriotism, but spreads violence and hatred in order to improve our country, doesn’t grasp the true meaning of these concepts. As I reflected on all these thoughts (while trying to translate them to kid-ese), I kept coming back to community building. The founding fathers tried to build a country. When the country was falling apart, FDR rebuilt it. I look at today’s Recovery & Reinvestment Act signs with the same pride I feel when I come across an old WPA project. While we studied a painting of Pickett’s charge, I told the boys they did it because the country was falling apart. They needed to save it. What have I done to live up to that? Is living a good life enough? Most importantly, more than any other lesson on this trip, I want my sons to walk away with gratitude. I want them to realize every day that something as simple as a hot shower is a miracle (if you doubt that statement, picture Haiti in your mind). I tried to grasp the unimaginable hardships that happened on those fields but I couldn’t do it. I couldn’t picture walking hundreds of miles in blistering heat, no food or shoes, carrying a gun on my back that was intended to kill other people. And I should be grateful every day for those who did it. 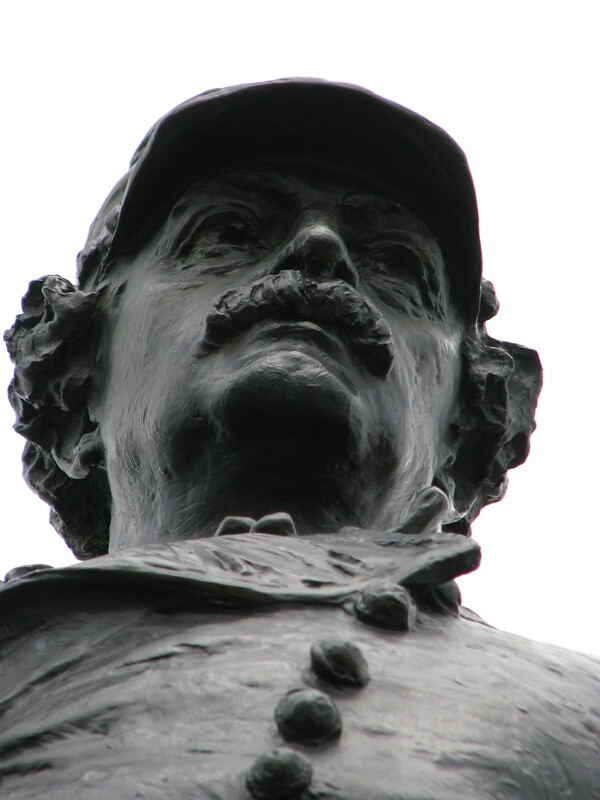 This entry was posted in Life Beyond Work and tagged boys and war, Dave, Gettysburg by Amy Pybus. Bookmark the permalink. Enjoyed your article in the Gazette 7/5. Refreshing, common sense (to some folks) teaching of rules to behave by! Alot of kids seem to have missed out on common courtesy early on. I teach school and am astonished every day at students’ reactions to my automatic (mother of four)corrections of their manners or lack of them. A large number of them show genuine interest and say they’ve never heard some of the information before. We need a reality show about manners!